We are expecting the President to announce his nonimees for the next defense secretary and the next CIA director. The event is at 1pm in the East Room of the White House. The briefing is at 2pm. Two sources close to Hagel have also been told to expect the defense secretary announcement on Monday, and additional sources – a senior administration official and a source familiar with the nomination – said Obama spoke to Hagel Sunday by telephone. WHITE HOUSE AND WE HAVE DISASTER IN THE MAKING AT THIS TIME IN OUR HISTORY. Capitalizing your letters do not make your words more profound.....Hagel's service does make him profound.....only 4.5% of the eligibles particpated in Vietnam, and only .45% have participated in the military since 2001....We don't need LImbaugh, Giuliani, Romney, types, all who dodged the draft in the 60's to tell us what bravery is all about. You forgot to mention Obama – who broke the law and didn't even bother to register for the draft. Only GOP members dodged the draft? What branch did Clinton serve in? How about Biden? Draft dodgers cross party lines! What about Romney..what about Cheney...what about Gingrich.....what about Rush Limbag? Richard S. Flahavan, Selective Service System Associate Director of Public and Intergovernmental Affairs, confirmed in a March 2009 letter to Kenneth Allen that Obama did register for selective service on July 29, 1980 at a Honolulu, Hawaii post office. So, John as usual you would be wrong! Seriously? Obama was not required to register for selective service as an elected official. People in his age group were pretty much exempt in the resumption of the draft during the 80s. If you apply for certain federal jobs you may be required to. Obama broke no laws. There are people who did dodge the draft from both parties. That doesn't automatically disqualify them from public office, nor should military service be a requirement. We are a country where our Commander in Chief is a civilian, but distinguished service in our military certainly does boost the resume to fill positions where their experience holds some advantage. My mistake, it seems Obama was required to register for selective service. I thought he was a couple of years older and thus exempt. Also, Jean is correct as it appears Obama did register for selective service on July 29, 1980. We are in a different time. Back in the day (WW II, Korea, Vietnam, cold war) it was preferred a Commander In Chief have military experience. That is not as true today! We are living in different times! As far Sen. Hagel is concerned it will be interesting to have a SecDef with an enlisted background! It will also be interesting to see how the GOP votes on this. The reason I say this is if they use this to fight against te president, they will end up fighting against one of their own! This should be a position where personal politics means little! Agreed, a sign of the times and not necessarily for the worse. It does make sense that in times of relative peace we elect people who do not necessarily have a military background although there were some talk of Petraus running for President in the near future. I don't think all these rumblings will amount to much and Hagel will become the next Defense secretary unless Obama changes his mind. I hope he gets picked because he is exactly what we need. What hang-ups are you talking about? Please elaborate. STEVEO, Clinton was NOT a draft dodger. He registered for the draft after dropping out of the ROTC and received a number that was never called up before the war ended. Let me restate my point! There are politicians from BOTH sides of the aisle that did not serve in uniform! Thanks for the correction but I was responding to John who somehow forget to add a single Dem name to his post! Veterans qualify for eyeglasses ....try a pair! HEY WEZER YOU ARE AWAKE IF NOT ALERT. YOU JUST GOT UP AND LOOKING FOR FRESH MEAT TO CHEW IT SEEMS. WELL I AM NOT FRESH OFF THE BOAT AS YOU SEEM TO BE. YOU ARE NOW DISSMISSED AND MAY GO BACK TO SLEEP. And you are a day late and no doubt a dollar short. KNOW THAT IS A HARSH REALITY BUT TRUE JUST THE SAME. Hagel is also a past two-term Senator as well as a decorated war veteran. He isn't hiding in his house posting nonsense. SPEAK AS WE WISH. YOU DO,WE ALL DO. THANK OUR FOUNDING FATHERS FOR THAT STROKE OF THE PEN. As far as Hagel being used up – Not even close. As far as YOU being used up, your rambling nonsense speaks for itself. Some make good use of their lives and never stop serving. Some just serve it up. You would fall in the latter catagory. ENVISIONED FOR US FOR EVER. KEEP IT OR SCREW IT UP FOR ALL OF US–ITS YOUR CHOICE. Hagel will get approved easily no matter how much the media says he won't. At the very least, this is one thing that Rand Paul should have no problem voting yes to. What the hell are you talking about? Put people back in the stocks? That's the kind of talk that got Joe Biden in trouble. It is time we had a realist for the position of Secretary of Defense. Someone who prioritizes the security and future of America and is willing to disagree with our allies should that priority be questioned. Chuck Hagel will also see to it that our country does not fall further into debt by making sure we do not have wasteful spending in the defense budget. He will not be intimidated by generals and defense contractors to overspend on the tools we need and also have the integrity to not put our people needlessly in harms way. For 'NAM VET' to come here and start questioning the man's sanity and emotional state because he claims to relate to the 'Vietnam experience' is absurd. Chuck Hagel is a decorated war veteran, 'NAM VET' is an impostor who didn't even know that RPGs were used in the Vietnam War. Stop polluting the comment section with your nonsense. Throbbing Member 2012. Say what you want, by all means. But given all of your past comments where do you get off telling others to "stop polluting the comment section"? How you libs can ignore the middle class getting hit once again by "big government" shows who you people really are. Libs = TAX AND SPEND other peoples money. Notice he got rid of HIS caps to retort, what a joke. John, Republicans have no problem spending either but of course, why ruin a good stereotype? But the best part is, they don't even bother paying for it and even gave tax cuts! Now that is sound economic policy. But of course, this has nothing to do with Chuck Hagel so I'm not even sure why you brought it up other than to start another stupid fight. I don't know why you are making this about me, if you have a personal grudge then by all means cry about it in some other thread. I am only commenting based on what has already been said and you come here and pollute things by not only showing your clear bias but adding nothing relevant to the conversation. That's right Moose, I took off the caps because it frightens you. I suggest you avert your eyes from NAM VET's posts. Oh, I hope I didn't scare you too much there. PRESIDENT,THAT IN IT SELF RAISES SOME REAL CONCERNS. THINK ABOUT IT. Disaster in the making was when Mr Bush was president. Two FALSE wars that cost us millions plus 4,000+ soldiers deaths. The world hated us when Bush was president, they even threw shoes at him over seas. Obama has stopped the wars and saved how many lives by doing so. He received the noble peace prize. If anyone spent 8 years digging a hole in their back yard, it would take more than 4 years to fill it back up. Has anyone seen Bush since he left – no because he's too scared to show his face. When I was over seas during the time Bush was president, our tour guide told us not to put American flags on our luggage, at one place we stopped when the fellow found out we were American he started yelling at us. Becasue Bush was an arrogant killer. Obama is a gentlemen and will treat everyone with dignity and respect. LOL, we have less respect now, Barrys a wimp and all countries know that, thats we are getting walked on by everyone. As far as killing look at Barrys drone strike record, you people amazr me, there is no difference both are ego maniacs. You sound like a political ad! 1. The CONGRESS ( BOTH parties voted to fund and fight those two wars) wasn't Pelosi the speaker back then? 2. We are still in Afghanistan! One war was stopped not two. I will credit the President for getting us out of Iraq. 3. Yes we have seen Bush! Don't believe being scared to show his face has anything to do with anything! 4. Obama has authorized drone strikes than Bush ever did. So is he (in your words) an arrogant killer too? Sounds like the truth...would make a good political add. Sounds like the truth? Half truth or skewed truth? Well Steveo ...tell me who was President in 2001 when the Afghan War started? Who was President In 2003 when the Iraq war started? Tell me where are those WMD that were never found? Tell me Steveo if the 4000+ figure between 2001 and 2008 is in dispute? Tell us those wars did not only cost millions but billions! And check sources, and you will find those wars were not funded. The money was borrowed on the nations credit card from people on social security, and federal employees retirement benefits..... to be paid back in the future....and that future was to be after Bush left office. As for popular if Bush is so popular why was he not invited to the GOP convention...was it because his presences would stir up memories and not be helpful? Suggestion........Quit trying to rewrite history. Jean, I think you are a little off topic on this one. Without going off another war funding discussion, please explain which of the four items Steveo mentioned are false. Did Congress vote on funding for Iraq and Afghanistan? Yes or no. Are we still in Afghanistan? Yes or no. I don't know about you, but I have seen Bush make appearances other than the Republican convention. Did President Obama authorize drone strikes? Yes or no. The whole drone strike program bothers me as it is just too much power granted for extrajudicial killings. While I do not like it, and most certainly Obama has much to answer for it as Bush if not more, the Administration will probably have the excuse of the Afghanistan war to conduct these operations. When we pull out of Afghanistan, who knows for sure if these strikes will stop? I am hoping this is something Hagel can bring some sense to and prevent misuse. Thanks December. The truth is that I really don't know too much about Hagel. Certainly not enough to say he isn't qualified. So far, from what I have seen, he seems perfectly qualified for Defense Secretary. I'm not worried about Hagel at all. I am worried about Brennan for CIA Director. The guy practically started the drone strike program. Your suggestion to me is to quit rewriting history? I am rewriting nothing! My suggestion to you is to quit ignoring it. I am aware fully these wars were placed on a credit card. I am also fully aware Democrats voted to fund these wars on a credit card! Kerry, if you remember, voted for the war as did Clinton, and several other DEMOCRATS! Both parties played a role in getting us to Iraq AND Afghanistan. Both parties, Jean! If you as remenber, what did Obama primarily use against Clinton back in 2008. Her war vote! YOUR Democrats voted to go to war too, regardless of who was in the White House! Just a fact! If White House policy is drone strikes and more of them, No SecDef is going to be able to change that. One of the problems is this Who is really running that program? I think it may be more CIA than Defense, just my guess because I really don't know! If that is the case, a new SECDEF is not going to change that policy! In saying that, I can see why Brennan rather than Hagel would be the issue for you! That's just it Steveo, both DOD and the CIA use drone strikes and the CIA has taken it to a new level, beyond the parameters of the Afghanistan war. They have their own covert operations and their use of Defense resources in these efforts is unprecedented. The War on Terror has no boundaries it seems. 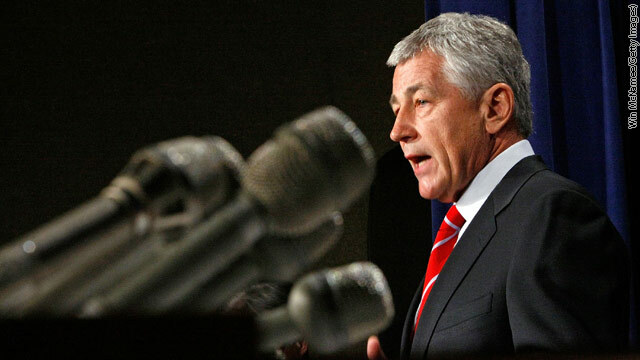 Will Hagel just toe the line? That seems contradictory to who he is and Obama knows that. I think there will be a fight and I think it is one we need to have. You asked if Hagel will toe the line. Cabinet postions don't lend themselves well to rebels. I think Hagel knows this and he still wants the job. I'm sure he still will be able to present his views but he will still be working for the president. Nice article Jean. Congratulations, you have just provided an article that eliminates belief that George Bush lied about the WMD. "Curveball", the Iraqi defector who fabricated claims about Iraq's weapons of mass destruction, smiles as he confirms how he made the whole thing up. So are you saying Bush outsmarted the Dems (Clinton, Kerry, Edwards, ect)? Just admit you will NEVER be fair to the GOP, just admit it and be done with it!. Several articles ago, you were still hammering McConnell even as he worked out the FC deal with Biden! You gave all credit to Biden and none to McConnell. Like if Biden was negotiating with himself! That is your right but you lose credibility! Secondly, you fail to mention the fact the our allies had the same intel as Bush! BTW didn't Clinton have a little something to do with reduced intel capability? Yet all Bush all the time! Even if Pelosi, as speaker at the wrote the check! According to you, the Dems were just spectators only. If that is the case, they failed us! Not one Dem read the intel reports, not one? I find that hard to believe! Obama lengthened the time we'll be in Afghanistan and pushed up troop levels, it was the "good war", remember? The plan to withdraw from Iraq was already on the books, Obama merely followed it. There were a few drone strikes under Bush but nothing like what Obama has taken it to. "US President Barack Obama won the 2009 Nobel Peace Prize largely for offering the world hope, rather than for any practical achievements, and possibly as an encouragement for what he might accomplish after receiving the prize." RIGHT NOW. WELL IT IS NOW AND THEY ARE WAITING YET. Well, let's see, Chris Christie was on the news today saying that he has called John Boenher 3 times and hasn't heard back. You know it's the Congress that holds the purse strings on this --don't you? Obama broke the law and didn't bother to register to vote???????????????? What did Bushy boy do. The point was registering for selective service and not to vote! And he did register for the draft see my post above....and see the form online. Slow down a little. My point was the coment on registration was related to selective servive and not for voting, as Linda alluded to. You don't see me agreeing with John. I am just clarifying the remarks. I wasn't disputing your point just clarifying that he did register. Isn't it amazing had Romney won, and wanted to appoint Hagel there wouldn't have been a peep from the GOP nitwits crying over this. I really think it is a good move to pick someone for Defense who won't be willing to put our average grunt in harms way at every whipstitch. War should always be the last option. The GOP is not fond of Hagel so I highly doubt he would have been even thought of by Romney, had he won! REMEMBER PEARL HARBOR-PROBABLE NOT. WE WAITED TO LONG ON JAPAN AND ALSO TO ENTER THE WAR IN EUROPE-IT COST US TWO MILLION AMERICAN LIVES' HAD WE LISTEND TO GEN BILLY MITCHEL WE WOULD HAVE HAD A REAL HEADS UP ON THAT WAR IN THE PACIFIC. I HOPE I HAD HIS NAME RIGHT, I WAS ONLY MONTHS OLD THEN BUT LATER I LEARNED IN SCHOOL OF OUR HISTORY FOR GOOD AND BAD. HISTORY DOES REPEAT IT SELF. BUT FEW SEEM TO LEARN FROM IT. Chuck Hagel was a patriot and if you look at the videos from not to far back (even after his remarks about the Iraq war ) republicans like McCain and McConnell and Graham too where saying what a hero and patriot he is. Only since the talk of a nomination has he been dragged through the mud by his fellow republicans. Obama did register for selective service as was the law at that time. Nam vet is an imposter who would besmirch the character of. a war hero That seems to be the republican way anymore. Serve your country and run for office and they will drag you down with lies. What these middle of the road intelligent republicans should do is switch party's apparently if you are smart and reasonable they will throw you to the wolves. This is all just manufactured by the media for drama and ratings, want to bet that he gets confirmed easily even by the Republicans? Agreed. Let's hear from the man himself and see what he says Rumors are swirling about whether he is a friend to Israel. That is not a SecDef issue, that belongs to the White House (policy), Sec State (diplomacy), and the Congress (funding). The SecDef will get the marching orders from the CIC, get advice from the Generals and Admirals and roll from there! The media is suckering a whole lot of folk. I'll just wait to hear from Hagel first! NORTH VIETNAM ADDMITED THAT WE WON ALL THE BATTLES, BUT OUR OWN GOV AND PEOPLE LOST US THE WAR AND THE HOPE FOR A FREE SOUTH VIETNAM. THAT IS HARD TO TAKE FOR ANY SERVICEMAN OR WOMAN WHO DID SERVE. Eisenhower put us in Nam. Would you be saying that if Obama had not nominated him and he was still a senator? Has anyone Hagel served with in Nam come forward as they did for Kerry? We who served know Kerry is a fraud...and it makes me sick he is taking State, but then I expected another moron to replace clinton. We have had some really good and qualified secretaries of state Rice, Vance, Haig, and etc... I know clinton was a political payoff, but can't we just have a qualified and impeccable Secretary of State? Need more info on Hagel...I'm suspicious of him in that he gets along with obama too well...and obama is not the type to cuddle up to anyone unless he has something in mind, underhanded that is.